Gardena Automatic Water Computer Model 1162. Safe operation with battery level display. On-screen instructions for simple programming. Adjustable water flow. Durable and rust-proof. New condition. All parts have been inspected and verified working condition. What you see is what you will receive. Gardena 1860-28 Classic Plus 3-Cycle Water Timer T 1030 Plus. Condition is New. Shipped with USPS Priority Mail. Set from 5 to 120 minutes. Switches off automatically. Water flow can be set. Includes hose connector. Hand Tools And Tool Accessories. Drip and Soaker Hose Compatibility: Yes. Color Family: Multi color. NEW IN BOX! 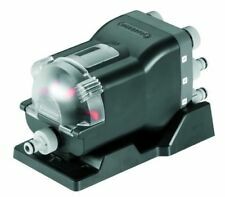 Gardena model 1197-20 water distributor for watering your garden or irrigation. Programmable: Yes. Drip and Soaker Hose Compatibility: Yes. Includes hose connector. Water flow can be set. Dial programming for 5 typical garden applications. Well designed LCD screen to view all your programs clearly. Sensor connection for water saving irrigation. We're happy to help. Our dedicated staff is happy to help. Up for sale is a Gardena rain sensor kit. I had it outside for a weekend, but ended up removing the system. Looks brand new. Item will ship immediately. Includes GARDENA Comfort water stop connectors. Lock trigger on with for continuous watering without fatigue. Includes GARDENA Comfort water stop connectors. 32121 Features: -Includes hose connector/water stop. 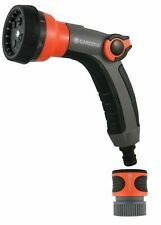 -For lawn and garden watering. Product Type: -Pistol nozzle. Finish: -Orange, grey, black. Primary Material: -Plastic. This has been lightly used but works like new. This is model number 1176-25 PLUS the Water Computer 2010 - model 1175-25. AND GARDENA WATER COMPUTER 2010. MODEL 1176-25 AND 1175-25. What you see is what you will receive. Publisher: Gardena. Label: Gardena. Plant and or garden areas are watered as per the programming of the Water Computer (not included) one right after the other. Product Features. Programming the unit is intuitive and easy. o Colour: Grey & Orange. o Integrated battery level display indicates when the battery needs to be changed. o Battery Back-Up: No. o Clear LCD display on the Water Computer shows the selected settings. At a glance, you can see 1. the water consumption per season, 3. the water consumption per watering session 4. the current flow in litre per minute. An integrated battery-level display secures precise operation. It allows two independently set programs on two separate outlets. o Digital Display: Yes. o The integrated battery level display indicates when the battery needs to be changed. o Computer Software Compatible: No. O Can be connected to the following GARDENA water computers; G1864, G1862, G1883, G1881, G1830. o Optical-electronic operation allows a fast reaction to the start of rainfall. o Rain Sensor can be stuck with the spike into the bed beside the plants, or placed on a solid surface. With the GARDENA Rain Sensor electronic, natural rainfall is considered with the automatic irrigation. The Rain Sensor can be stuck with the spike into the bed beside the plants, or placed on a solid surface. Ideal for lawns and garden watering. Low flow rate to be used in conjunction of more online pop up sprinklers. A easily removable built in filter. Spray direction easily adjustable. Flow rate 660 l/ph. Clear on screen instructions make programming simple, while the removable face ensures you are not bending down at the tap while setting the programs. o Up to 6 independent daily programs can be selected. O Connects to the following GARDENA water computers; G1864, G1862, G1883, G1881, G1830. o Includes 5m cable plug. o Save water by only watering when required. o Made in Germany. No matter what happens, you will get your product or your money back. For operation, two 1.5 V alkaline batteries are required (not included). A weak battery level is indicated. Add to favourites. Dispatch location: Berlin. We will compare serial no. If the battery is weak, this is indicated. Easy programming using the rotary knob. Low battery indicator. O Colour: Multi. o Engineered to last with a high pressure rated to 80,000 test cycles at 1600 KPa. o Battery Back-Up: No. Our Promise. o Digital Display: No. No matter what happens, you will get your product or your money back. Item Model Number1814-U. 1-year warranty; model 1840-U. Classic model with large, easy to use rotary knobs for simple programming. Item Model Number1860-U. With battery level display. Rain sensor. Item Model Number1189-U. Manufacturer: Gardena. Easy to read LCD display. Auto Feature shows amount of water usage per watering cycle. Easy re-set button. Learn More. Why Buy From JandJ Ultra?. Batteries: 1 CR2 batteries required. Water flow can also be set. Overall Width - Side to Side: -6". Overall Depth - Front to Back: -3". Overall Product Weight: -1.5 lbs. Garden quick connect fitting. Item Model Number31169. Dial programming made quick and easy programming. Well designed LCD screen view all your programs clearly. Sensor connection for water saving irrigation. Auto Feature shows amount of water usage per watering cycle. Easy to read LCD display. Easy re-set button. Operates with a model CR-2032 battery. Battery level display shows battery life. Battery included.